I have﻿ been reading this book for the past few days, and to be honest with you all, I can't put it down. Well I am actually reading it on my Kindle app, but that is beside the point. The adoration that I have for Beth Moore's writing and speaking is huge. She is an amazing woman with a spunky personality. God has blessed her immensely with the ability to communicate- and her words always hit home with me. I have always wondered why there seems to be so many stories of church leaders who fall to sin- but I guess I never really thought about the fact that Satan's attack against them, because they are people of influence, is that much greater. I am sure you all have your own stories of people you knew or looked up to who have been lead astray. Beth talks about how because we are living in the End Times, we will see more and more of people who fall to ungodly things. But mark this: There will be terrible times in the last days. 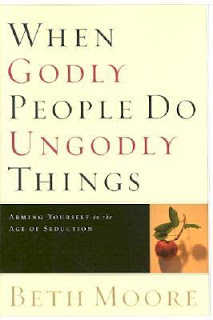 People will be lovers of themselves, lovers of money, boastful, proud, abusive, disobedient to their parents, ungrateful, unholy, without love, unforgiving, slanderous, without self-control, brutal, not lovers of the good, treacherous, rash, conceited, lovers of pleasure rather than lovers of God- having a form of godliness but denying its power. Have nothing to do with them. They are the kind who worm their way into homes and gain control over weak-willed woman, who are loaded down with sins and swayed by all kinds of evil desires, always learning but never able to acknowledge the truth. Those 'times' surely sound like our 'times'. Don't they? Here is where I struggle- If there is someone out there who could help me with this, your input would be greatly appreciated. 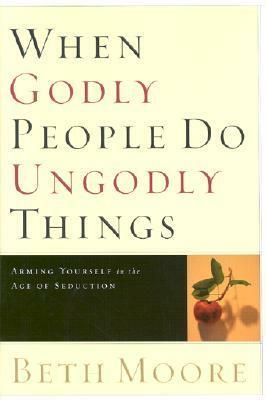 How do you love people back after they have chosen the ungodly way- if they don't want to be reconciled? It is useless to give offerings to God while you are at enmity with your brother. Jesus said that His followers should be reconciled with anyone who has something against them. The world seeks reconciliation on limited terms. Christians are to be reconciled, whatever it takes. You say, “But you don’t know how deeply he hurt me! It’s unreasonable to ask me to restore our relationship.” Or, “I tried but she would not be appeased.” Jesus did not include an exception clause for our reconciliation. If the person is an enemy, Jesus said to love him (Matt. 5:44). If he persecutes you, you are to pray for him (v. 44). If she publicly humiliates you, you are not to retaliate (v. 39). If someone takes advantage of you, you are to give even more than he asks (v. 41). The world preaches “Assert yourself.” Jesus taught, “Deny yourself.” The world warns that you will be constantly exploited. Jesus’ concern was not that His disciples be treated fairly but that they show unconditional love to others regardless of how they were treated. Men spat upon Jesus and nailed Him to a cross. His response was our model: “Father, forgive them, for they do not know what they do” (Luke 23:34). If there were ever a command that is constantly disobeyed, it is this mandate to be reconciled. We comfort ourselves with the thought, “God knows that I tried to make things right, but my enemy refused.” God’s word does not say “Try to be reconciled,” but “Be reconciled.” Is there someone with whom you need to make peace? Then do what God tells you to do. December 23rd has been my favorite day of the year since I have been in high school. There are always fun things to do and I feel like if I truly thought about it, I might be able to remember every 12/23 for the past 10 years. The anticipation and excitement that I feel for the next few days coupled with fact that I just finished wrapping the last of the gifts and making 3 kinds of cookies with my adorable mom makes me so thrilled for the celebration of the birth of Our King. Today I am just thankful. Thankful for a Savior who loved us so much that he came to earth knowing that He would have to be the sacrifice for you and me. I am grateful for the love that He is despite my constant sin- not just the love he shows us, the love he IS! This was yesterday. Lots of presents to be delivered. Here we are on our delivery from today. This is Meal's On Wheel! I am thankful that nearly 6000 gifts will be delivered to sweet seniors this week! It is such a blessing! Believe it or not, I am completely done with wrapping gifts for Be a Santa to a Senior. To be honest with you, I cannot believe it myself. When this season started, I was worried. Worried was an understatement. I was sleepless and overwhelmed. This has been the busiest season our company has ever had, and I knew that i would not be able to devote every waking moment to micromanaging every second of the program. If you know me well at all, you would know that I have a bit of a control issue... Again another understatement. So even though I was unable to control every bit of this amazing few months, it has been accomplished... And today as I sit on my couch watching 'The Invention of Lying' I feel relaxed and at peace and for that, I am soooo thankful! Today has been so productive. I have sent out two more shipments of presents- totally about 500 gifts to 200 seniors. It is always so amazing watching the cars, packed to the brim drive away. Today I am thankful- more like overwhelmed. I am so blessed that God has chosen me to work in a place that sees people as top priority, a place that no matter what will cling to relationship. Nearly 4 1/2 years ago when I started working here at Home Instead. I met a client named Mr. F. This little man stole my heart from the first moment that I met him. He is about 5 foot tall and weighs probably 100 lbs. We actually provide care for his wife, and he had always done the insurance billing for her. I will never forget the first time I met him. He came in, feet shuffling beneath him. In his hands was an envelope that held all of his wife's insurance forms. He wanted me to sit and help him fill them out. After looking through the paper work, I realized that no matter how I described the papers to him, he would still be confused. The silly papers are simply confusing! I told him that I would do it for him. The look that came over his face was relief mixed with joy. So because of Mr. F, I now bill nearly 50 insurance companies and handle claims for seniors. Every year for the past 5 Christmases, this sweet Jewish man sends me a Christmas present. Today, I was feeling the stress of bills and presents and all, and there in the mail was this card... this card filled with a generous Christmas present! Today I am thankful for God knowing just what we need, when we need it! 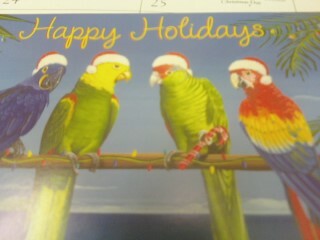 Check out those crazy birds wearing Santa hats!!! When I woke up at 7:30 to the sound of my sweet parents putzing around in the kitchen. I hopped right out of bed to make eggnog scones. We had a nice breakfast and then my brothers, Rachel and myself went out to finish up some Christmas shopping! It was a blast all being together! 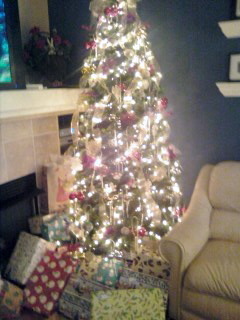 When we got home, I wrapped all the gifts and put them under the tree. I don't know about all of you, but there is something about wrapped presents under the Christmas tree that truly brings Christmas to the next level for me. I get giddy thinking about cute little faces waking up on Christmas morning to open gifts and fish out goodies from stockings. This year, the kids will be sleeping over on Christmas eve, so we will get to enjoy every minute of that with them! I can't wait. Today I am thankful that after 3.5 days of work that I get to be back here with this adorable family sharing Christ's birthday with them! life is fast. it is rushing by! I don't even have time to think. As I type this, I am being summoned to help my mom make her bed. Today I am thankful for great relationships with my whole family. We all get along great. As a matter of fact, Slim and Greg have been off gallivanting across town the past 5 hours. I'm off to make a bed- and then to play some cards! Please be merciful to me :) I will promise to do better this week! I love my God, my husband, and my sweet dogs! Real Time, Or, "Three-Two-One: Blast Off!" loud music. messy faces. and big dreams.